Note: Data for biomass-based diesel are actual gallons, not ethanol equivalent. While RFS implementation in the United States has been constrained by a slower than expected ramp-up in production of cellulosic biofuels, other factors contributed to a shortfall from EISA 2007 volume standards as well. U.S. motor fuel consumption has been much lower than initially projected, meaning less overall transportation fuel is available in which to blend biofuels. In addition, ethanol blending into gasoline has mostly been limited to 10% blends because of infrastructure and demand issues. The 2019 final rule sets the total U.S. renewable fuel volume requirements at 19.92 billion gallons, a 630 million gallon increase in the advanced biofuel target relative to 2018 levels. Advanced biofuels include fuels such as imported sugarcane ethanol as well as fuels that qualify for the biomass-based diesel (biodiesel and renewable diesel) and cellulosic biofuel targets. In recent years, the majority of advanced biofuel RFS credits have been generated from biomass-based diesel consumption. The final rule also increased the biomass-based diesel target to 2.43 billion gallons for the 2020 compliance year, as this fuel category is set one year ahead of the other targets. Conventional biofuels in the United States were held at the statutory cap of 15 billion gallons for the third consecutive year. Most fuel used to comply with the RFS program remains conventional biofuel derived from corn starch ethanol. Over time, EISA 2007 envisioned that an increasing share of renewable fuel would be cellulosic biofuels, which have a lower greenhouse gas emissions profile than conventional biofuels. Cellulosic biofuels were intended to grow to 16 billion gallons by 2022, but the technology has not matured fast enough to meet the volume standards. Since the first year of its enactment (2010), EPA has exercised its cellulosic waiver authority to reduce the cellulosic biofuel target every year. 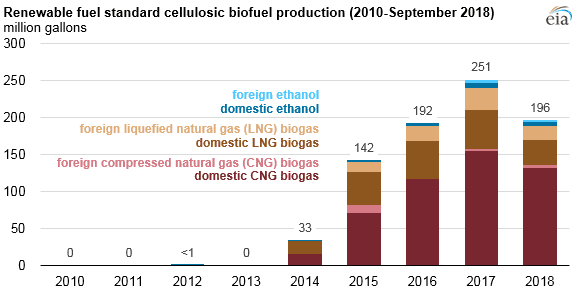 The 2019 final rule set the cellulosic biofuel mandate at 418 million gallons, or about 5% of the 8.5 billion gallon target envisioned by EISA 2007. Because the total volume of renewable fuel is at least 20% lower than statutory levels for total renewable fuel for the second consecutive year, EPA is expected to modify applicable volumes for compliance years 2020 through 2022, an exercise known as the reset rule. Note: Data for 2018 are through September. Growth has occurred in cellulosic biofuels during the last several years, but at a much lower rate than originally envisioned by Congress. About 10 million gallons of cellulosic ethanol was used to comply with the RFS in 2017, about half of which was produced domestically. A 2014 final rule expanded EPA’s definition of cellulosic biofuel to include certain types of biogas. Since then, most of the increase in cellulosic biofuel consumption is from biogas, also called renewable natural gas, in either compressed or liquefied form. Production of renewable natural gas during 2017 was nearly 250 million gallons of ethanol equivalent.